1. Name two of the methods of internal switching on typical switches today. Which provides less latency for an individual frame? Answer: Store-and-forward, cut-through, and Fragment Free switching. Cut-through switching has less latency per frame but does not check for bit errors in the frame, including errors caused by collisions. Store-and-forward switching stores the entire received frame, verifies that the FCS is correct, and then sends the frame. Cut-through switching sends out the first bytes of the frame before the last bytes of the incoming frame have been received. Fragment Free switching is similar to cut-through switching in that the frame can be sent before the incoming frame is totally received; however, Fragment Free processing waits to receive the first 64 bytes, to ensure no collisions, before beginning to forward the frame. 2. Describe how a transparent bridge decides whether it should forward a frame, and tell how it chooses the output interface. Answer: The bridge examines the destination MAC address of a frame and looks for the address in its bridge (or address) table. If found, the matching entry tells the bridge which output interface to use to forward the frame. If not found, the bridge forwards the frame out all other interfaces (except for interfaces blocked by spanning tree and the interface in which the frame was received). The bridge table is built by examining incoming frames' source MAC addresses. 3. Define the term collision domain. Answer: A collision domain is a set of Ethernet devices for which concurrent transmission of a frame by any two of them will result in a collision. Bridges, switches, and routers separate LAN segments into different collision domains. 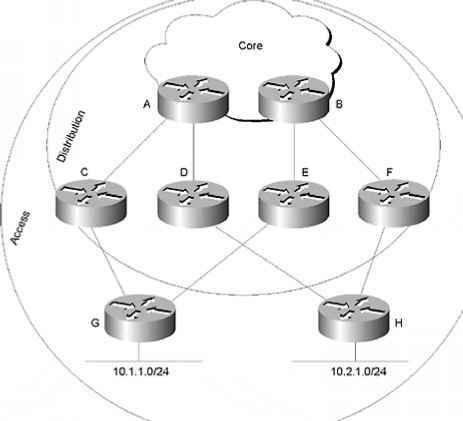 Repeaters and shared hubs do not separate segments into different collision domains. 4. Name two benefits of LAN segmentation using transparent bridges. Answer: The main benefits are reduced collisions and more cumulative bandwidth. Multiple 10- or 100- Mbps Ethernet segments are created, and unicasts between devices on the same segment are not forwarded by the bridge, which reduces overhead. Because frames can be sent over each segment at the same time, it increases the overall bandwidth available in the network. 5. What routing protocol does a transparent bridge use to learn about Layer 3 addressing groupings? Answer: None. Bridges do not use routing protocols. Transparent bridges do not care about Layer 3 address groupings. Devices on either side of a transparent bridge are in the same Layer 3 group—in other words, the same IP subnet or IPX network. 6. If a Fast Ethernet NIC currently is receiving a frame, can it begin sending a frame? Answer: Yes, if the NIC is operating in full-duplex mode. 7. Why did Ethernet networks' performance improve with the advent of bridges? Answer: Before bridges and switches existed, all devices were cabled to the same shared Ethernet. The CSMA/CD algorithm was used to determine who got to send across the Ethernet. As the amount of traffic increased, collisions and waiting (because CSMA/ CD) increased, so frames took longer to send. Bridges separated the network into multiple collision domains, reducing collisions and allowing devices on opposite sides of the bridge to send concurrently. 8. Why did Ethernet networks' performance improve with the advent of switches? Answer: Before bridges and switches existed, all devices were cabled to the same shared Ethernet. The CSMA/CD algorithm was used to determine who got to send across the Ethernet. As the amount of traffic increased, collisions and waiting (because of CSMA/CD) increased, so frames took longer to send. Switches separated the network into multiple collision domains, typically one per port, reducing collisions and allowing devices on opposite sides of the bridge to send concurrently. 9. What are two key differences between a 10-Mbps NIC and a 10/100 NIC? Answer: The obvious benefit is that the 10/100 NIC can run at 100 Mbps. The other benefit is that 10/100 NICs can autonegotiate both speed and duplex between themselves and the device that they are cabled to—typically a LAN switch. 10. Assume that a building has 100 devices attached to the same Ethernet. These users then are migrated onto two separate shared Ethernet segments, each with 50 devices, with a transparent bridge between them. List two benefits that would be derived for a typical user. Answer: Fewer collisions due to having two collision domains. Also, less waiting should occur because twice as much capacity exists. 11. Assume that a building has 100 devices attached to the same Ethernet. These devices are migrated to two different shared Ethernet segments, each with 50 devices. The two segments are connected to a Cisco LAN switch to allow communication between the two sets of users. List two benefits that would be derived for a typical user. Answer: Two switch ports are used, which reduces the possibility of collisions. Also, each segment has its own 10- or 100-Mbps capacity, allowing more throughput and reducing the likelihood of collisions. Furthermore, some Cisco switches can reduce the flow of multicasts using the Cisco Group Message Protocol (CGMP) and IGMP snooping. 12. How fast is Fast Ethernet? 13. How does a transparent bridge build its address table? Answer: The bridge listens for incoming frames and examines the source MAC address. If it is not in the table, the source address is added, along with the port (interface) by which the frame entered the bridge. The bridge also marks an entry for freshness so that entries can be removed after a period of disuse. This reduces table size and allows for easier table changes in case a spanning tree change forces more significant changes in the bridge (address) table. 15. Does a bridge or switch examine just the incoming frame's source MAC, the destination MAC, or both? Why does it examine the one(s) that it examines? Answer: The bridge or switch examines both MAC addresses. The source is examined so that entries can be added to the bridge/address table. The destination address is examined to determine the interface out which to forward the frame. Table lookup is required for both addresses for any frame that enters an interface. That is one of the reasons that LAN switches, which have a much larger number of interfaces than traditional bridges, need to have optimized hardware and logic to perform table lookup quickly. 16. Define the term broadcast domain. Answer: A broadcast domain is a set of Ethernet devices for which a broadcast sent by any one of them should be received by all others in the group. Unlike routers, bridges and switches do not stop the flow of broadcasts. Two segments separated by a router each would be in different broadcast domains. A switch can create multiple broadcast domains by creating multiple VLANs, but a router must be used to route packets between the VLANs. 17. Describe the benefits of creating 3 VLANs of 25 ports each, versus a single VLAN of 75 ports, in each case using a single switch. Assume that all ports are switched ports (each port is a different collision domain). Answer: Three different broadcast domains are created with three VLANs, so the devices' CPU utilization should decrease because of decreased broadcast traffic. Traffic between devices in different VLANs will pass through some routing function, which can add some latency for those packets. Better management and control are gained by including a router in the path for those packets. 18. Explain the function of the loopback and collision-detection features of an Ethernet NIC in relation to half-duplex and full-duplex operations. 19. Describe the benefit of the Spanning Tree Protocol as used by transparent bridges and switches. Answer: Physically redundant paths in the network are allowed to exist and be used when other paths fail. Also, loops in the bridged network are avoided. Loops are particularly bad because bridging uses LAN headers, which do not provide a mechanism to mark a frame so that its lifetime can be limited; in other words, the frame can loop forever. 20. Name the three reasons why a port is placed in forwarding state as a result of spanning tree. Answer: First, all ports on the root bridge are placed in forwarding state. Second, one port on each bridge is considered its root port, which is placed in forwarding state. Finally, on each LAN segment, one bridge is considered to be the designated bridge on that LAN; that designated bridge's interface on the LAN is placed in a forwarding state. 21. Name the three interface states that the Spanning Tree Protocol uses other than forwarding. Which of these states is transitory? Answer: Blocking, Layer 2 listening, and learning. Blocking is the only stable state; the other two are transitory between blocking and forwarding.